The REDWING 40 LR is a new version of the successful REDWING series. She is designed for long range cruising on an economical budget. Her new Vee hull with box keel will provide comfortable seakeeping ability. She will be ideal for that intracoastal trip and will not be inhibited in a chop in open water. She will be equally at home on local waters or island hopping in the tropics. Her efficient hull can easily be powered to cruise at 8 knots and 10 to 12 knots at the top end if desired. Range is 500 to 1,000 miles depending on the power and fuel capacity. She has accommodations for four in two separate staterooms and the dinette converts to a double when more room is needed. 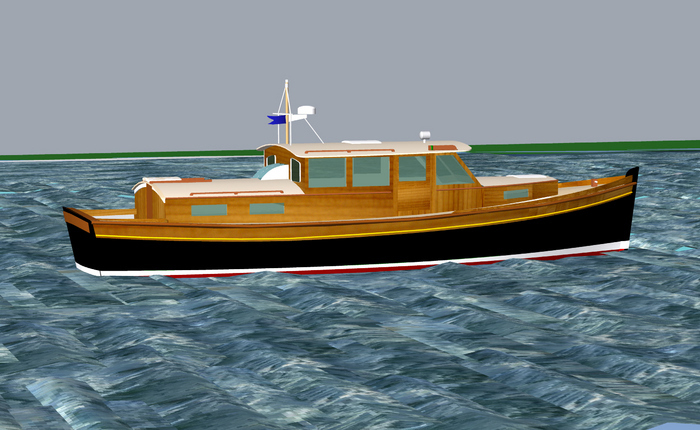 Her hull is economically built in plywood-epoxy, aluminum or steel at very modest cost. She is a wonderful boat for that weekend getaway or as a home afloat for long term cruising. Purchase and Download Study Plans for the REDWING 40 LONG RANGE for $5.00 in PDF format (zipped file). Purchase Construction Plans for the REDWING 40 LONG RANGE for $1800.00 for delivery by US Postal Service.